ITSM Help Desk (powered by HEAT) – Kifinti Solutions Inc.
Say goodbye to the clunky, inefficient trouble ticketing systems of the past. Ivanti Help Desk (powered by HEAT) provides an easy to use customer service help desk for dealing with inbound ticket requests from any channel—email, web, social, phone, or chat. 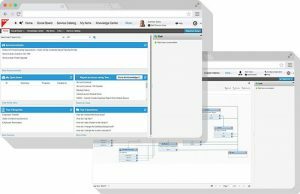 It also offers case management, self-service options, and knowledge management combined with workflow and automation capabilities. So IT is more efficient, and users are happier and more productive. Are you considering Ivanti Help Desk (powered by HEAT) software as your help desk solution? Let the Kifinti Solutions expert team help you. We can leverage our many successful implementations to help make your project a success. Ask about a free product evaluation.